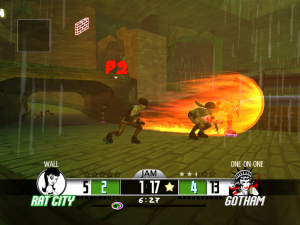 Jam City Rollergirls could be one of WiiWare's biggest breakout hits: roller derby has a fanatical, rapidly expanding fanbase, and the revelation of this WiiWare roller derby title generated plenty of interest outside the usual download audience. Now we have the first screenshots and footage of the game in action, that interest could grow even higher. 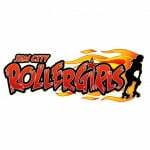 A cross between roller derby and racers such as Mario Kart Wii, Jam City Rollergirls mixes licensed teams with out-there tracks featuring speed boost pads, classic oil patches and tractors. Over-the-top power-ups and plenty of physical contact feature heavily too, and on the whole the game looks like it's shaping up surprisingly well. 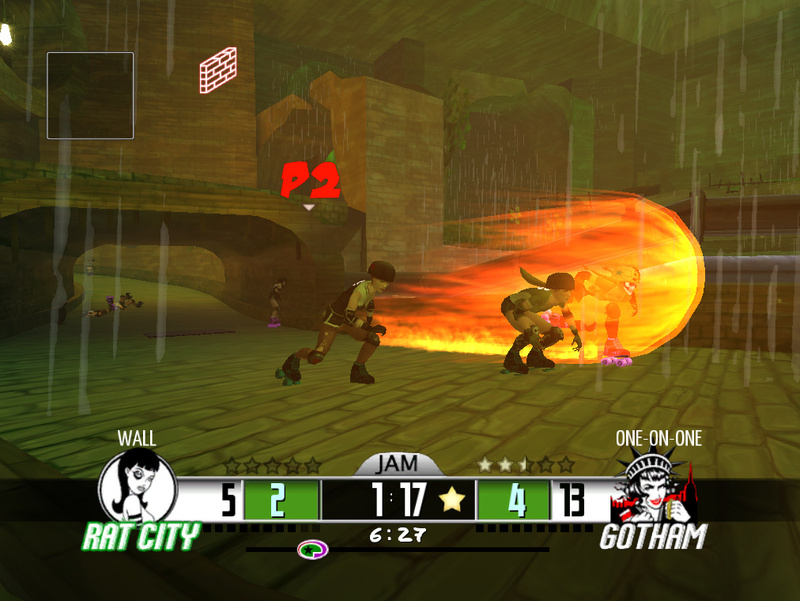 You can head over to our Jam City Rollergirls screenshots page to see the stills or engage in three minutes of motion below. I played this at PAX w/ the Producer. It was a pretty fun game. There are a couple of unique mechanics in there. The ability to get pushed through the crowd is awesome. Looks like this is a newer build then what I played. The newer tracks look hilarious. I'm pretty interested. That looks just ugly, imo. The characters don't even have shadows! The gameplay seems pretty clunky, too. somehow i feel reminded of Road Rash.....just with girls.......on skates. but seriously this looks like a great mashup between Mario Kart, Road Rash and Gamecube era nostalgia. I actually know someone who's likeness is in the game. My friend is the mascot for her team, actually. Hey! It's just like real life. No spectators. Ohhhh burn. I am glad to finally see a gameplay video and some screenshots from this game. I was skeptical at first but it looks like it is coming along rather nicely. It could be a lot of fun. I will be keeping my eye on this one. Yikes, looks rough. And more than a little generic. I can see some of the criticisms if this were a retail title, but given the extreme size limitations imposed on WiiWare titles (like 43mb total? yikes), this looks pretty damned sharp to me! I'm a major fan of modern roller derby, so this game is probably gonna push me over the edge to finally get the Wii my kids have been nagging me for. Everybody wins! Why are the "screen shots" 800x600 when the Wii is lower resolution than that? And why is the Youtube video 720p? It's misleading. Argus, these are REAL screenshots from the in-game engine that we use at Frozen Codebase. They are in 800x600 because they are captured on a PC while the game ran on the Wii ndev kit. This is just the easiest way to capture them given the technology. The video is at 720p for the same reason, but all of it is done through the same renderer used on the wii: it's exact as in the same code is being used to draw this-- these shots are not meant to be misleading you will see the same graphics on your wii (same lighting, polycount, fidelity, etc...). We are our own publisher on this title and lack resources for a better way to take the shots. If you want to see what it looks like in 480-- select that on the youtube control. @14: Oh, this is Wiiware. Hah, I missed that, thought it was retail. @Raylax I count three mentions of WiiWare in the first two lines of this story. @bgeisler Thanks for clearing that up! @ y2josh Guess you should come to Indianapolis. NRG gets over 4000 fans to every home bout. Not too shabby, methinks.